It's yet another Festive Tiger Beetle! With such a big range they have lots of space for subspecies to develop. This one is Cicindela scutellaris unicolor, the name indicating that it's all one colour. Here it's a beautiful, shining cobalt blue. Look at it there on the white, quartz sand. The world is her catwalk! Her legs are long and slim and she has quite a few of them, but she won't be tripping over them too easily. No. For her the problem would be if a fly or whatever managed to escape her gigantic mandibles. Oh no! I tried to murder but I failed to murder! How embarrassing! Here's another kind of blue, a darker, meaner blue. Two yellow spots add a bit of levity, but you can't laugh at a face like that. She is not amused! 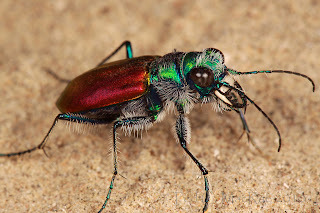 Anyone who misinterprets this flamboyance for a desire to be eaten (or laughed at) is subjected to the kind of stinky chemical that many Tiger Beetles can secrete. Some suggest that this Central American beast could even be a mimic of certain stinging wasps, specifically velvet ants of the genus Hoplomutilla. I don't know... it wouldn't be a particularly convincing mimic. 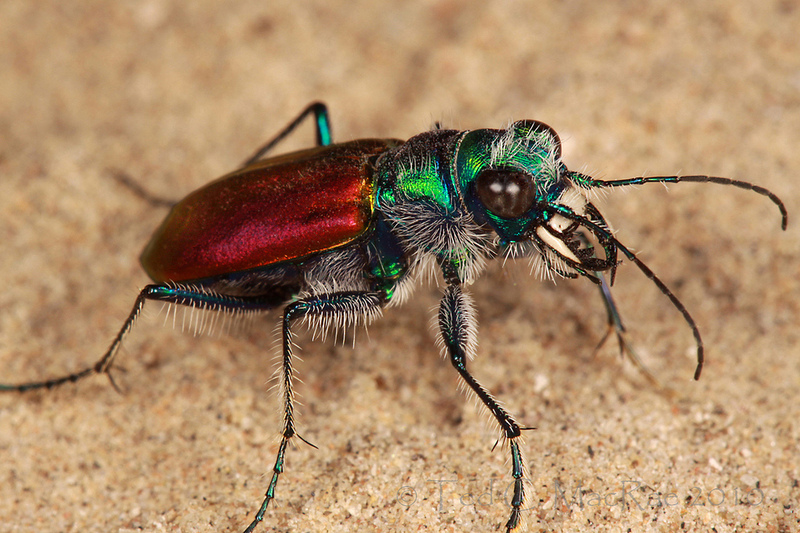 Then again, I imagine most Tiger Beetles would find it pretty difficult to pretend to be anything else. 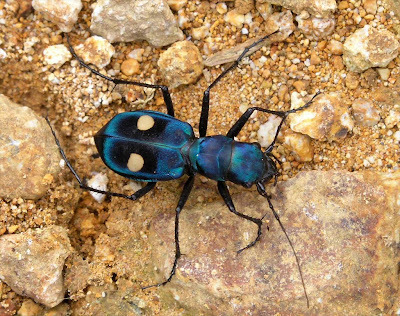 It's just so cool to be a Tiger Beetle! Another one from the United States. Despite the impressive design all over his back, this isn't a big biker guy who suffered a blowout on his Harley. Or his Demonskull Firecycle or whatever. No, the blowout here is when the earth is so dry and sandy that the wind blows out a depression in the ground. 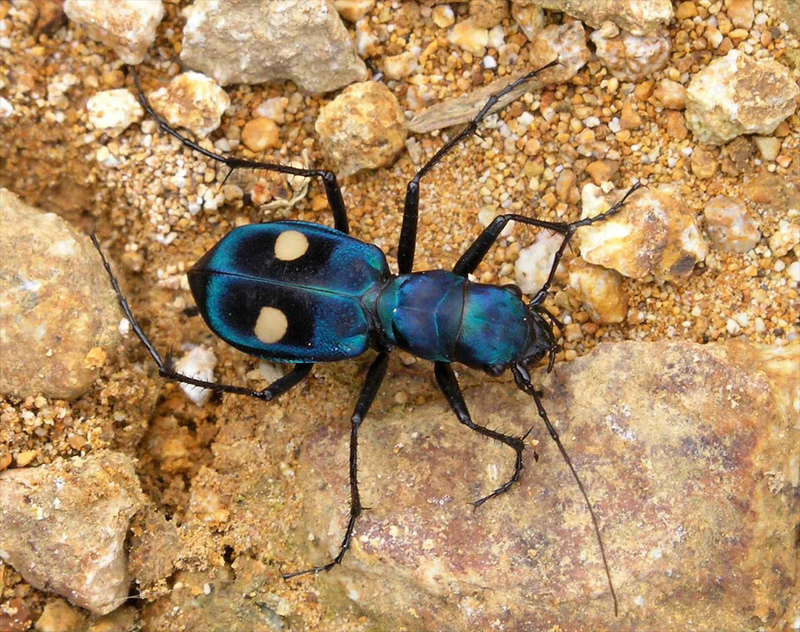 Basically, Cicindela lengi is a kind of Mad Max Tiger Beetle. 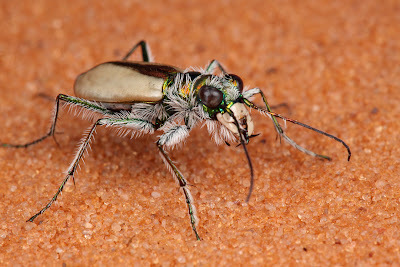 Or Fallout Tiger Beetle. It strides through the heat and desperation of a world gone wrong and makes it worse through judicious use of killing. Imagine it walking away with those amazing wing cases wobbling in the heat haze. Amazing! Probably best if he's walking away from you after a nice, diplomatic chat over tea and biscuits. Whooooa! Remember when I said that other one had a bit of a beard? Forget about it! This is like Robin Williams playing the lead role in a film called The Wolfman! Hang on... OK. Lon Chaney Jr. or Benicio Del Toro in a film called The Wolfman. This kind of hairiness is a rare sight, and the Coral Pink Sand Dunes Tiger Beetle is found only in a small area of south western Utah. It's an area known as the Coral Pink Sand Dunes State Park, so named for all the coral pink sand dunes. If you're lucky enough to find C. albissima munching away on their latest catch, bring a tiny napkin along so you can lovingly wipe away the haemolymph and stray bits of leg from those luscious whiskers. I think it would be a very moving experience. Lets get out of the arid sands and climb up a tree in Southeast Asia instead. 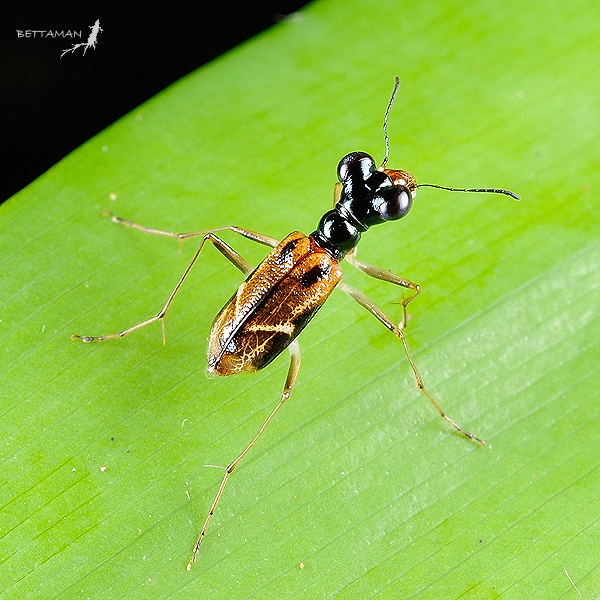 Tiger Beetles of the genus Neocollyris are a little different from most. They're a lot more svelte than the others, with smaller jaws, a really thin thorax that looks like a neck and a much slimmer abdomen. And of course they're arboreal, spending their time in trees. You'll be pleased to know that they retain an utterly furious facial expression to go along with their attractive, metallic sheen. 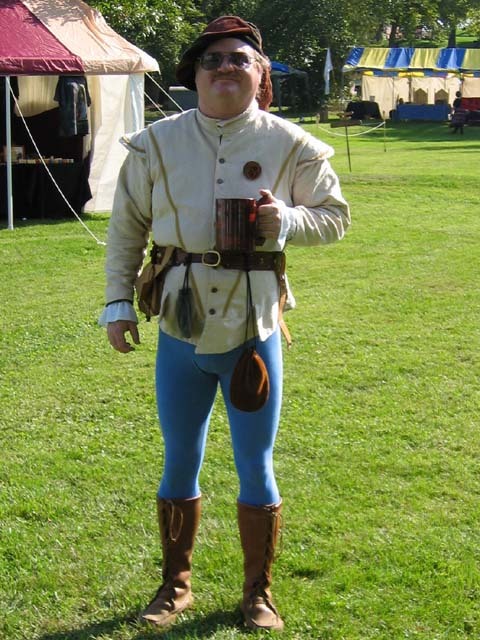 This one also has legs that appear to be clad in boots and britches. Very fetching! I don't want to be morbid, but doesn't that thorax look perfect for a pawn in a chess set? Maybe you could leave the head on and make it a bishop? A very angry bishop, of course. Did you find E.T. "cute"? 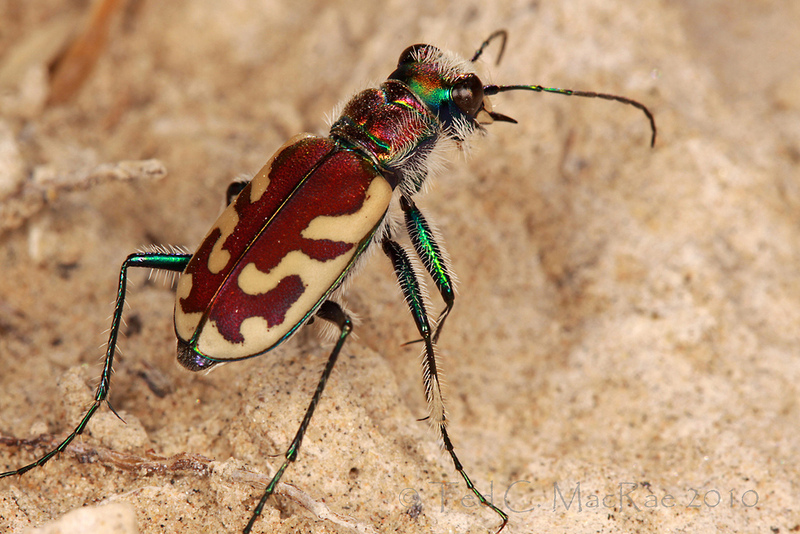 If so, this may well be the adorable little Tiger Beetle for you. If instead you thought the haggard, pogo-necked abomination was an unholy alliance between The Mummy's Curse and a pair of binoculars, you might want to look elsewhere. This controversial little blighter can be found in Taiwan. 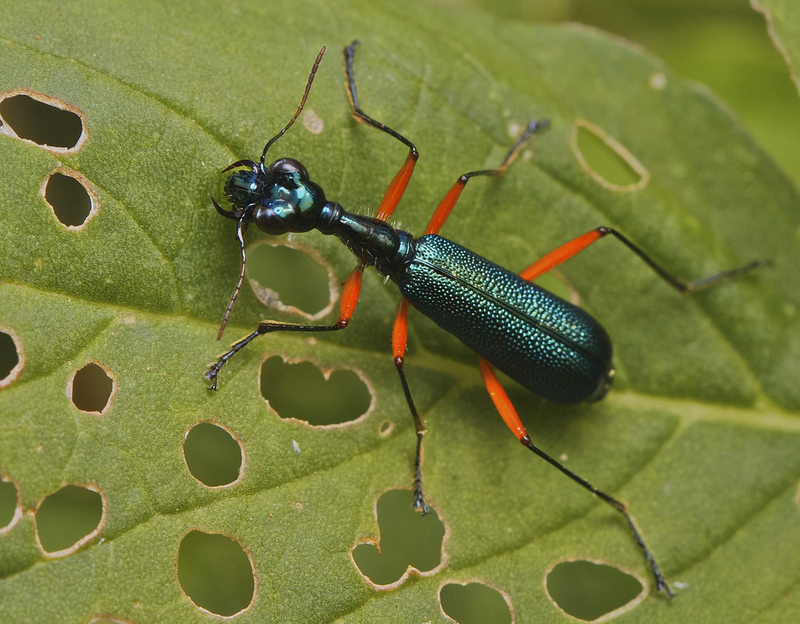 It shows us just how important it is for a Tiger Beetle to have excellent vision. Even if the eyes don't really fit on the head, they still must be there. 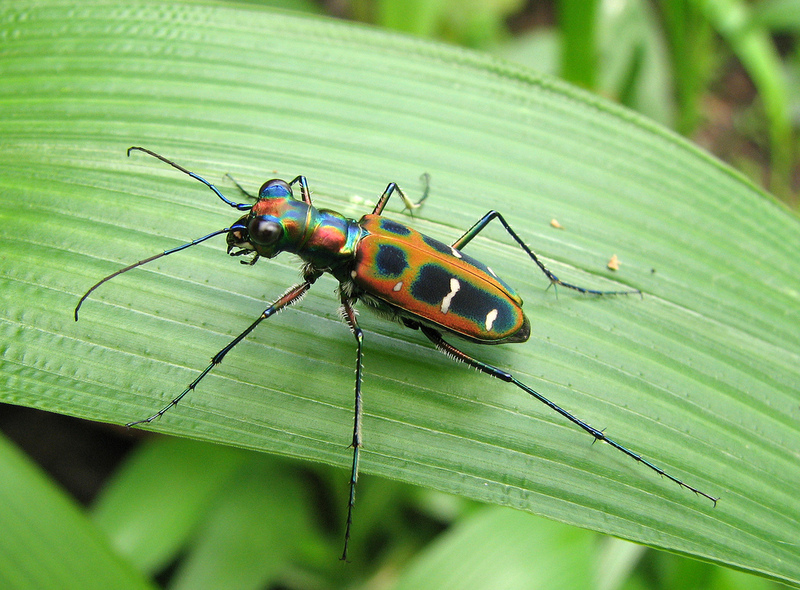 It comes from India, it's in Cicindela and it's probably related to something like C. virgula. Regardless, this is some remarkable colouration! 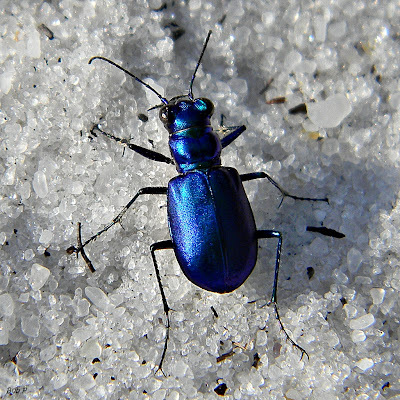 I think we know by now that the iridescence comes almost as standard, that's just how a lot of Tiger Beetles roll. But check out those wing cases! The midnight blue, the deep orange with a wisp of rich green and lackadaisical white stripes. Gorgeous! In fact, there's a slight feel of Easter to go along with the Christmas we started off with. Couldn't you just imagine it as a modern stained glass window? 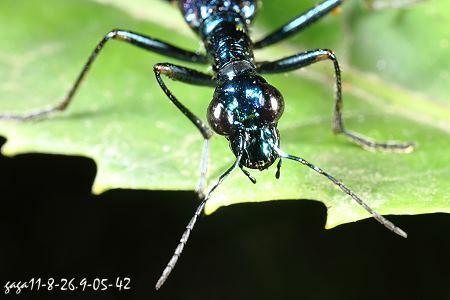 And if all that garish colour becomes too much for you then look no further than this fine example of Cicindela oregona. 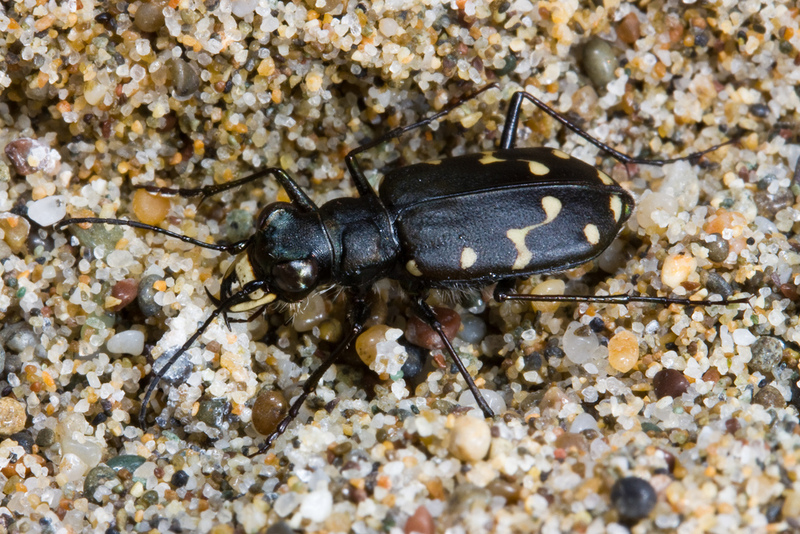 They're also known as the Oregon Tiger Beetle, but they can be found from Alaska all the way down to Mexico. So they're only partly Oregon because of how incredibly Western they are! With this huge range they can afford a bit of variability. Some are green, others more olive or brown. I like the tasteful simplicity of this black one with it's elegantly curved markings. But I'm quite sure it wouldn't look so black in a different light, doubtless it would sparkle with a very dark brown. And if you see it from the side there is still iridescence on the legs and so on. 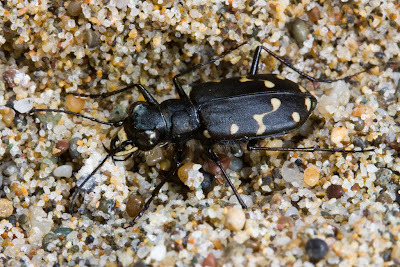 Another thing is that there is another very similar species easily confused with the Western Tiger Beetle. 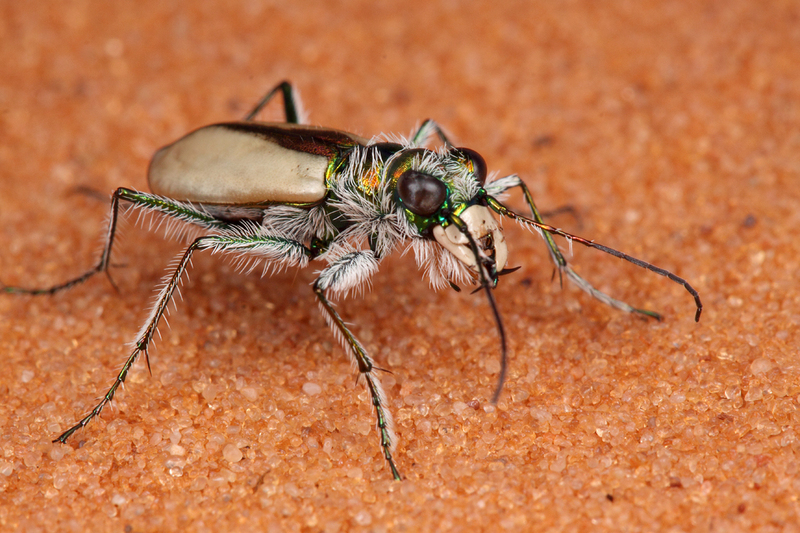 It bears the rather unhappy name C. depressula, the Dispirited Tiger Beetle. Apparently it's named after the long, middle part of their markings. If you think of them as little legs, you will see that the Dispirited one's knee is significantly less knobbly. I guess this makes them very unhappy, and it certainly looks like the Western's markings are kicking up those heels with a lot more enthusiasm. It's OK though. Once the Dispirited Tiger Beetle finds something to kill, successfully kills it and then eats it, they'll be just fine. Tiger Beetles are admirably uncomplicated like that. @autopsyjude: Ha! I'm glad I could entertain you with my ignorance! @shewalkssoftly.com: I know! Sometimes I wish I could have an iridescent exoskeleton. I guess I have to satisfy myself with an Iron Man costume. @TexWisGirl: I bet people used to say that when Santa Claus was still new. It's great that we can relive it all today! Many people are not aware that Tiger Beetles can be pets. 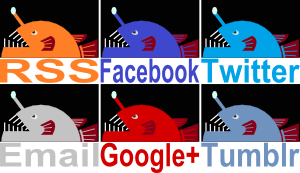 I hope it is ok to share this link with your readers who may be interested in learning more about that? No problem! That's a cool article!